Welcome to the Red Dead Redemption 2 Online Treasure Maps locations guide that helps you find the Treasure Maps locations in the PS4 & Xbox One Western action-adventure online game. The overview for all these in-game Treasure Maps locations is listed below. Note: You’ll be able to get a treasure map once you reach level 10?. After that you receive a treasure map every 5 levels you progress. Tips: Sometimes if you spare (instead of kill) a Gang Hideouts leader it will result in him giving you a treasure map as thanks. So make sure to choose that option if simply looting the dead men’s bodies in a Gang Hideout you attacked doesn’t result in you finding a treasure map. Where to find all Treasure Maps in Red Dead Redemption 2 Online? The in-game collectibles locations for the Treasure Maps that lead to cash and gold bars are described in this detailed guide with voice-over tips. 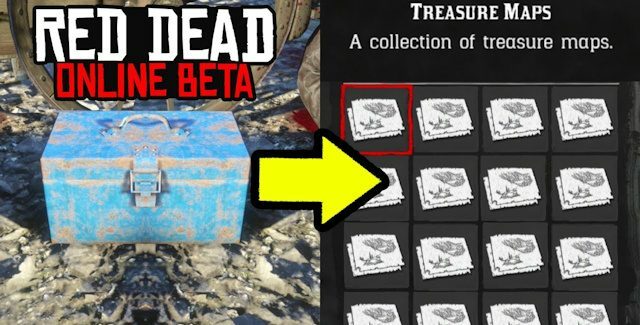 The Treasure Maps are listed in the step-by-step video guide. I hope these tips helped you get more of the Treasure Maps hidden in the game. Huge thanks to OutlawGarry for the guide video and tips. Please comment if you have any additional Red Dead Redemption 2 Online Treasure Maps location tips of your own, we’ll give you credit for it. – Thanks for visiting!